An advocacy service in each state and territory provides information, support and advice regarding rights and responsibilities in residential facilities, and can assist with any complaints. Contact the My Aged Care helpline on 1800 200 422 for details. The Age Page is the front page of your telephone book. It lists many services for older people. For complaints regarding residential care facilities and Community Aged Care Packages call 1800 550 552 or visit the ACCC website. The Aged Care Standards and Accreditation Agency is the independent body responsible for managing the accreditation and ongoing supervision of Australian Government-funded aged care homes. The Agency has offices in all state capitals. 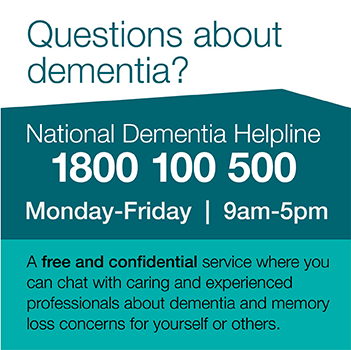 The National Office can be contacted on 02 9633 2099 or visit the Aged Care Standards and Accreditation Agency website. You can contact the My Aged Care helpline on 1800 200 422 for any aspect of aged care. Commonwealth Carer Resource Centres provide carers with information and advice about relevant services and entitlements. Contact your closest Commonwealth Carer Resource Centre on 1800 242 636 or visit the Carers Australia website. COTA is an independent organisation working on behalf of older people. You can contact your state or territory COTA office by calling the number listed on the Age Page of your telephone book or visit the COTA website. We provide information, education, counselling and support to people living with dementia and families and carers of people with dementia.